A-HOTEL.com - Luxusné a lacné ubytovanie Méaudre, Francúzsko. Ceny a rezervácia hotelov v Méaudre a v okolí. Toto je orientačná ponuka najviac rezervovaného ubytovania v destinaci Méaudre za poslednú dobu a je radená od najlacnejšieho ubytovania až po najdrahšie hotely. Pre výber ubytovania podľa Vašich preferencií odporúčame vyberať z celkom 5 ponúk ubytovanie v Méaudre. Po zadaní dát svojho pobytu a použitie filtra si môžete vybrať najlepšie možné ubytovanie v destinácii Méaudre. Zadaný dátum pobytu je pre presný výber miesta na prespanie kľúčové, pretože sa od neho odvíjajú všetky on-line informácie o cenách a obsadenosti ubytovania. Vybrané miesta na prenocovanie (hotely, apartmány a pod.) je potom možné ihneď rezervovať. Situated in Méaudre, 1.9 km from Petit Chatelard, Hotel La Prairie has a seasonal outdoor swimming pool and garden. In the Vercors Natural Regional Park, Arcanson sits in a renovated farm house with a garden. Free ski and bike storage facilities are available and include a boot heater and an area to clean and pump the tyres of bikes. At Meaudre, in the heart of Vercors region and 35 km from the city centre of Grenoble, in a pleasant setting whatever the season, come and savour the charm and quiet of our family inn with its shaded terrace, on a half-board or full-board meal plan in order to enjoy our traditional and regional cuisine, or just for the night in one of our 9 comfortable rooms. Auberge du Furon also features a creperie. Located in Méaudre and 2 km from the ski slopes, Le Gîte de l’Ourserie is housed in a renovated farmhouse. 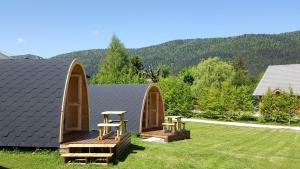 It offers rooms with mountain views and a garden with outdoor furniture. Featuring a terrace, bar and views of mountain, Auberge le Sabot de Vénus is situated in Méaudre, 600 metres from Petit Chatelard. This 2-star hotel offers free WiFi. This wooden chalet-style hotel is situated in the middle of the forest at an altitude of 1218 metres. It offers spacious rooms and a restaurant which serves regional cuisine. In the Vercors Natural Regional Park, Coeur des Montagnes offers a terrace with sun loungers, a lounge with fireplace, ski-to-door access and ski storage. Free private parking is provided. Chalet les Bruyères is a chalet set in Lans-en-Vercors, 3.2 km from Lans en Vercors Ski School. Featuring free WiFi and a seasonal outdoor covered heated pool, Camping Le Vercors is located in Autrans, 6 km from Sure. Quoi Ski Lift is 7 km away. Hotel Au Feu De Bois was built in 1968 for the Winter Olympic Games. The hotel is located in Autrans within the Vercors Massif. Situated in Autrans and with Sure reachable within 7 km, Le Petit Chalande provides ski-to-door access, non-smoking rooms, free WiFi and a garden. Offering a shared lounge, the property is located within 8 km of Combe de la Quoi. Featuring a terrace, a garden and a children’s playground, Hôtel La Tapia is located in Autrans. The property has a restaurant on site and offers free WiFi access. La Chalande apartments are situated in Autrans ski resort in Vercors Regional Natural Park. These spacious apartments all feature stone walls and wooden beams, each has a terrace or a balcony, and they all have free Wi-Fi access. Situated at the centre of the village, the hotel "De la Buffe" is a friendly mountain hotel which welcomes guests all year round for a pleasant stay in the wide open spaces and deep forests of the Vercors. Your hosts, Madame and Monsieur Aribert, attentive to your every need, will welcome you to the warm atmosphere of their hotel and invite you to partake of the pleasures of our reputed restaurant. Maison Charpichon is a holiday home situated in Villard-de-Lans, 3.5 km from Glovettes Ski Lift. Warm and quiet hotel of 17 pleasant bedrooms overlooking the surrounding nature. Terrace, park, swimming-pool surrounded by greenery. Situated 600 metres from the centre of Autrans ski resort in the Vercors National Park, Résidence Odalys Le Sornin offers fully furnished accommodation and free parking is available nearby. At Résidence Odalys Le Sornin, the apartments with private balcony present fully equipped, ready-to-live-in spaces, complete with optional hotel services including bed and bathroom linen and cleaning service. This hotel is located in Villard-de-Lans, 200 metres from the sports centre, swimming pool and ice rink. It has stylish rooms with free Wi-Fi access and a TV. Located opposite the water centre and casino, Le Dauphin offers guest rooms with a TV, and access to a garden and terrace. The shuttle to the ski lift is also directly across the street. You can be sure that your stay at The Grand Hotel de Paris will reflect all that is good about the Bestwestern chain. Each journey will be a unique experience as you are welcomed to an atmosphere of charm and extreme comfort.